Professor Charles Baden-Fuller has become a Fellow of the Academy of Social Sciences (AcSS). Professor Charles Baden-Fuller has been elected as a Fellow of the Academy of Social Sciences after an extensive peer-review process. The academy is a representative body for social sciences in the UK, with 90,000 members and around 1,100 Fellows, including academics, practitioners and policymakers. Announcing 47 new Fellows, AcSS said the individuals were being recognised for the “excellence and impact of their work through the social science for the public benefit”. “The outstanding contributions of each new Fellow are a testament to the breadth of the social sciences, both in their ability to inform policy for public benefit, as well as in addressing some of our most pressing societal issues. 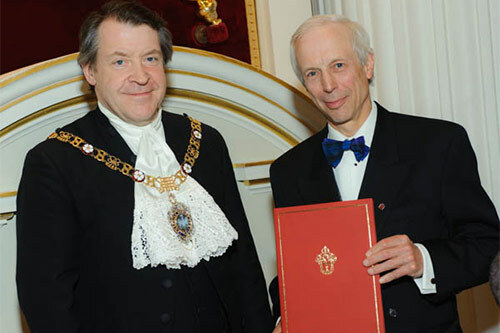 Charles Baden-Fuller (above, receiving the City Chancellor's Award) is Centenary Professor of Strategy in the Faculty of Management at Cass Business School.